Markets: Equity markets ended the week with a positive return of 0.8%. Emerging markets and US equities performed well while Japanese equities disappointed. Global bonds ended the week with a gain, helped by strong returns from US bonds on the back of recent Federal Reserve (the Fed) comments (see chart of the week for more). UK equities performed well with Sterling ending the week at £0.876 versus the Euro. Earnings: It was a busy week for fourth quarter company earnings. With around half of the companies in the S&P 500 having reported to date, 73% have beaten expectations on earnings with close to 60% beating on revenues. Brexit: On Tuesday, the House of Commons voted to renegotiate the current Withdrawal Agreement with emphasis on changing the Irish backstop section. The Prime Minister has two weeks to try and renegotiate with the EU before facing Parliament again. Members of Parliament also rejected leaving the EU without an agreement in place. Trade War: Chinese Vice Premier Liu was in Washington for two days of trade talks. Progress was made at the talks with China promising to expand purchases of U.S. goods. Both sides planned further discussions to reach a breakthrough - there is only a month to go before the Trump administration is set to increase tariffs. US Data: November's US new house sales was much stronger than expected, beating the estimate. Hiring also came in ahead of expectations with non-farm payrolls reported at 322,000. 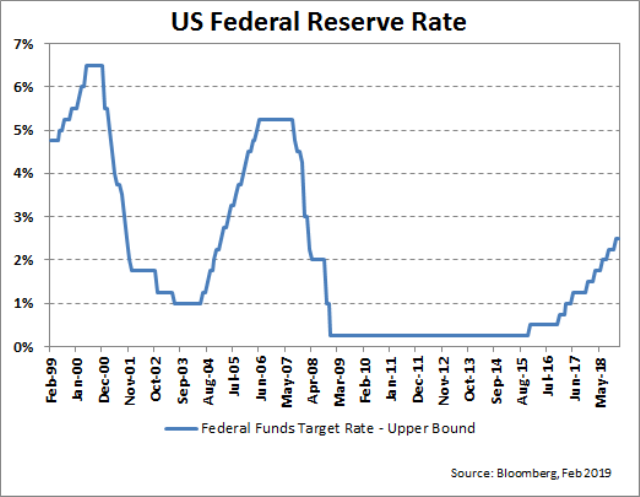 The US Fed kept the Federal Funds rate unchanged at the meeting last week. The Fed has completed a full reversal from its hawkish (higher rates) bias late last year. It has also removed guidance suggesting the next move would be a hike, highlighting it would be patient on the back of downside risks and muted inflation. The market has been trying to price the final Fed rate level. The current level at 2.5% is still well below the peak levels of early 2000 and 2006 as shown in the chart above. At this early stage in 2019, the market isn’t pricing in any more rate hikes in the foreseeable future. Central Banks: Bank of England meets on Thursday to review monetary policy. Economic Data: US GDP for quarter 4 is expected to be released during the week following delays from the government shutdown. US factory orders, durable goods, US PMI also released in the US. In Europe PMI Data from France, Germany and Eurozone. Earning Season: Google, Walt Disney Ryanair, BP, BNP, GlaxoSmithKline are among the companies reporting. Politics: President Trump delivers his annual State of the Union address on Tuesday. German Chancellor Angela Merkel visits Japan for talks with Prime Minister Shinzo Abe. Lunar New Year: Markets across Asia, including China, Hong Kong, Singapore, Taiwan, South Korea, Malaysia and Vietnam, close for part or all of the week for Lunar New Year. This document has been prepared by Bank of Ireland Investment Markets (“BOIIM”), is for informational purposes only. Any information contained herein is believed by BOIIM to be materially accurate and true but BOIIM expresses no representation or warranty as to such accuracy or as to such information’s completeness and accepts no responsibility whatsoever for any loss or damage caused by any act or omission taken as a result of such information and such information should not be relied upon for any purpose. Registered Office: Head Office, 40 Mespil Road, Dublin 4, Ireland. Registered Number: C-1.